Style & Strut is Vancouver’s Premier Bridal Fashion Event geared specifically at inspiring the bride in creating and assembling her perfect personal wedding style! On January 22, 2012 join in for a day filled with everything beauty, health, and style! From fashion shows and onsite beauty treatments to a very special presentation by Randy Fenoli, Fashion Director at Kleinfeld and Star of TLC’s Say Yes to the Dress this is an event you do not want to miss! Focusing on fashion and beauty for the modern and elegant metropolitan bride, this event promises to excite and indulge every one of its attendees. All day fashion shows featuring the latest in bridal fashion including wedding gowns, shoes & accessories. Also, providing Canadian couturiers with an opportunity to showcase their collections with buyers and media representation from around the world in attendance. Pampering on location! Sign up for a number of various on-site beauty treatments including skin care, lash extensions, mini manicures, brow treatments, and hair styling in our Style Lounge. If you have ever been curious about some of these services, this is a day to try them out for free! The opportunity to try on and play with some of the most coveted and fashionable jewellery and hair accessories by Vancouver’s elite designers and retail boutiques. Find Your Perfect Wedding Shoes! Browse through Vancouver’s hottest collection of bridal footwear from a variety of popular (and some newly discovered) shoe shops and designers. Delectable Hors D’oeuvres provided by the gracious host, The Sutton Place Hotel Vancouver. Fresita Sparkling Champagne compliments of our featured sponsor Bacchus Group. One on one discussion opportunities with Wedding Stylists & Beauty Experts in the Style Lounge. Group session with a professional Wedding Photographer offering suggestions and insight into how to pose like a pro and look your best in your wedding photos. 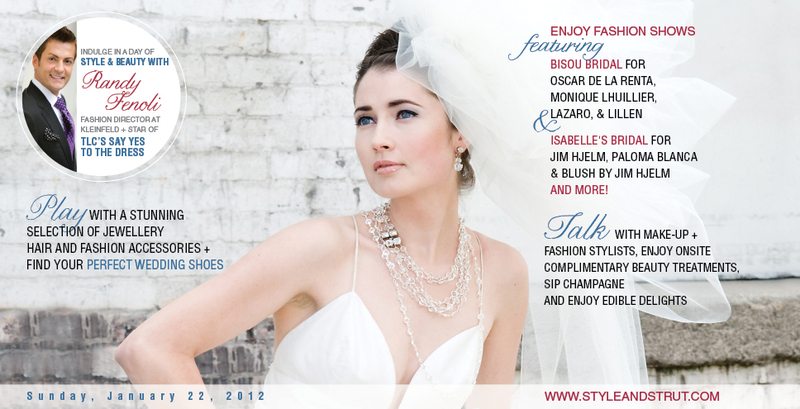 The Style Lounge at Style & Strut is a completely new experience for Vancouver Brides and guests! Have you always wondered what it would be like to try those fabulous lash extensions? Have you ever been curious about certain beauty treatments and practices for your wedding or just life in general? Join in for a fun filled and informative day of everything beauty for the bride and her entourage. The Style Lounge offers an elegant, fun, and indulgent opportunity to relax with girlfriends, try new things and learn about some of Vancouver’s best kept wedding style secrets. Style & Strut have assembled a fabulous team of beauty treatment specialists, stylists, shoe and fashion retailers, lingerie experts, hair and make up advisors, and other fashion, health and beauty professionals to offer brides and their guests advice, insight, sample products and services, and support as they move towards creating their perfect wedding style. From the latest skin care treatments (i.e. dermabrasion, laser treatments), lash extension services, and brow treatments to spray tanning, laser hair removal, teeth whitening, body bootcamp, yoga and more this is your opportunity to literally sit back in our elegant lounge areas and take advantage of the complimentary on site services being offered and chat one on one with health and beauty experts. Due to the strong interest in this event, the intimate setting, and limited # of seats available you must pre-purchase your tickets. Tickets will not be sold at the door. This ticket is for the bride and her girlfriends looking to spend a day being pampered, inspired, and educated! Enjoy complimentary onsite beauty treatments, chat with fashion stylists, play with jewelry, shop the city’s best bridal shoe collection, and in between enjoy champagne, hors d’oeuvres, and all day designer bridal fashion shows. Includes everything as listed under the General Access Pass, but in addition includes a seat at the 4:00pm highly anticipated one hour presentation by It’s All About the Dress author, Fashion Director of Kleinfeld, and star of TLC’s Say Yes to the Dress, Randy Fenoli. Hear Randy’s personal story and receive this bridal gown guru’s Top Tips and What to Consider when shopping for and choosing your ideal Wedding Gown. Win a personal meet & greet with Randy Fenoli! When you purchase a “Style & Strut VIP Pass”, you will automatically be entered to win a chance to win a personal meet & greet with Randy Fenoli! In the morning, the Bride and her friends will enjoy Sutton Place’s Jazz Brunch buffet in Fleuri Restaurant and a personal meet & greet with Randy Fenoli!